Pakistan’s surprise decision on Wednesday to liberalise trade with India augurs well for peace and prosperity in the region. Persistent opposition from hardliners and industrialists had stymied trade talks between the commerce ministers of the two countries last month. The troubled government of Prime Minister Yousuf Raza Gilani has shown unusual courage and vision by overcoming domestic hurdles and giving trade a chance to promote peace. The national Capital has been saved from a major terror strike with the arrest of two persons suspected to be terrorists associated with the Pakistan-based Lashkar-e-Toiba. That the arrested men are Indians and had come back after getting training from across the border shows that terrorist training camps continue to function in Pakistan. The Planning Commission last year suggested “universal health coverage”, for which it said the government needed to spend 2.5 per cent of the GDP on public health services, up from the present 1.4 per cent. The Prime Minister has now said it will be done by the end of the 12th Five-Year Plan. That is a bold commitment, given that at present 67% of the expenditure on health in the country is from people’s pockets. After turmoil across the country and in both Houses of Parliament over corruption, throughout 2011, one was hoping that the country and its leaders would be able to get back to addressing the serious internal and external problems we now confront and even reach consensus on key legislative issues of national governance. It was a free period. A friend suggested we sit in the “celebration ground” of the college and chat. Expecting fun, I joined her. What followed was interesting! She immediately got down to thumbing her Apple mobile! Occasionally she lifted her cell-glued eyes to look around and whisper “nice one”. While a host of issues are involved in any discussion on national security I shall focus essentially on certain aspects of the core issue: are the obtaining Union–State understandings adequate for the effective management of national security? Pakistan’s surprise decision on Wednesday to liberalise trade with India augurs well for peace and prosperity in the region. Persistent opposition from hardliners and industrialists had stymied trade talks between the commerce ministers of the two countries last month. The troubled government of Prime Minister Yousuf Raza Gilani has shown unusual courage and vision by overcoming domestic hurdles and giving trade a chance to promote peace. Hitherto, Islamabad had allowed trade in only 1,963 items placed on a “positive list”. Now trade will be open in any number of products except the 1,209 sensitive items kept on a “negative list”, which too would be scrapped by the end of this year if India too shows a positive gesture. The breakthrough in trade talks happened after India dropped its objections to the European Union cutting tariffs on Pakistani textiles last year. Pakistan responded by reviving the talk of granting India “most favoured nation” (MFN) status, which is a term popularised by the World Trade Organisation to convey that all members of the WTO will treat each other equally in matters of tariffs. India granted MFN status to Pakistan way back in 1996 but the latter has hesitated as industries in Pakistan fear their market would be swamped by cheaper Indian goods. The balance of trade is heavily in India’s favour. Due to pressure from industrialists the Pakistani leadership has increased the number of items on the negative list from the original 650 to 1,200. The policy of delinking trade from the sensitive issues of terror and Kashmir has proved beneficial. The bilateral trade, currently valued at $2.7 billion, can shoot up, given the cultural similarities and people-to-people warmth between the two countries. Delhi is considering allowing Pakistani investments. To build trust tariff barriers may have to be eased. The Wagah border may have to expand faster to cope with the rush of goods and people. Given the limitations of a single land route, more pre-partition road links will have to be revived. This may boost the economy of the war-ravaged states of Punjab, Jammu and Kashmir and Rajasthan. The national Capital has been saved from a major terror strike with the arrest of two persons suspected to be terrorists associated with the Pakistan-based Lashkar-e-Toiba. That the arrested men are Indians and had come back after getting training from across the border shows that terrorist training camps continue to function in Pakistan. One fails to understand how these camps are still functional despite the Pakistan government having pledged not to allow its territory to be used to launch terror strikes in India or any other country. The arrested persons were part of a major plan to strike terror in Delhi on or around Divali. The Lashkar’s idea, perhaps, is that India can be easily weakened by not allowing it to have communal peace. The fact that it continues to get local recruits for implementing its destructive designs is unnerving. Obviously, the country’s intelligence-gathering network has played a significant role in getting the terror plot foiled. Perhaps, strict vigil on terror modules after last month’s attack on an Israeli Embassy car has led to the success in nabbing the misguided persons. This is what should be done to fight the menace. Since terrorism remains as potent a threat to peace as it has been in the past, it is necessary to have a fresh look at the need for an agency like the National Counter-Terrorism Centre (NCTC). Politicising the NCTC idea will harm the country’s interests. A way must be found to answer the questions being raised relating to the federal character of the nation so that the NCTC soon becomes a reality. Union Home Minister P. Chidambaram is of the view that the NCTC must have the power to arrest terror suspects so that it can function effectively. He perhaps has a point as a toothless NCTC may prove to be only an addition to the number of agencies already functioning for fighting terror. The Planning Commission last year suggested “universal health coverage”, for which it said the government needed to spend 2.5 per cent of the GDP on public health services, up from the present 1.4 per cent. The Prime Minister has now said it will be done by the end of the 12th Five-Year Plan. That is a bold commitment, given that at present 67% of the expenditure on health in the country is from people’s pockets. The government has proposed free medicines as part of a “minimum package” of cashless outpatient, inpatient and diagnostic care for all citizens. Only the timing of the announcement would make sceptics wonder where the government would find the Rs 3 lakh crore for health over the next five years. At 6.1 per cent, the country is currently seeing the lowest growth in three years. The Prime Minister, however, has assured funds would be no constraint. If the government is ready to reset its priorities, it is indeed possible. While it would be a blessing for the poor to get free health care — for which 40 per cent of low-income families currently have to borrow money — results would be seen only if the taxpayers’ money actually reaches the poor. The National Rural Health Mission, which will be a major instrument for the delivery of the free health care proposed, today stands one of the most scandal-riddled programmes in various states. Also, health care is a state subject, and the Centre can exercise little control over how efficiently the money is utilised. Assuming the money would actually start flowing — most likely 2013-14 onwards — the planners will need to look at how and where to use it, for the country is woefully short of medical infrastructure. For example, India at present has one doctor per 1,700 people, as against one per 469 in the UK. The Prime Minister too has pointed to the need for capacity building to deploy the funds meaningfully. The pitfalls notwithstanding, reallocating priorities in favour of a critical human development indicator such as health care is a wise step. After turmoil across the country and in both Houses of Parliament over corruption, throughout 2011, one was hoping that the country and its leaders would be able to get back to addressing the serious internal and external problems we now confront and even reach consensus on key legislative issues of national governance. While inflation affecting the common man was showing some welcome signs of decline towards the end of 2011, it still remains at unacceptably high and indeed backbreaking levels for the majority of our citizens. There is also considerable uncertainty and confusion on how the government will deal with the fallout of the Supreme Court judgement cancelling 122 telecom licences approved by Mr A. Raja. Political controversy, however, has suddenly arisen from an issue of national security, on which there should normally have been a wide consensus, if not total unity. The 26/11 terrorist attack exposed glaring shortcomings in our intelligence and internal security structures. Over the past few years, the Home Minister, Mr P. Chidambaram, has sought to address these shortcomings that existed throughout the tenure of his impeccably attired predecessor. Seeking to coordinate and amalgamate the information available to all intelligence agencies, the Home Ministry came up with the idea of a National Counter-Terrorism Centre (NCTC) which would act as a nodal point for coordinating, analysing and disseminating relevant information to other Central Agencies and to designated authorities in state governments. The decision to establish the NCTC was formally conveyed to state governments on February 1, 2012. The Union government has set up the NCTC under the Provisions of Section 2 (C) of the Unlawful Activities Prevention Act of 1967. The work of the NCTC will be supervised directly by the Director of the Intelligence Bureau (DIB). The NCTC will have, under the Provisions of the Unlawful Activities Prevention Act, the powers for investigation, interrogation, arrest, detention and prosecution of those it charges with terrorism-related offences. It is also empowered to set up inter-state teams where terrorist cells are located across state boundaries. When state governments studied the powers assigned to the NCTC, over a dozen Chief Ministers went ballistic claiming that the Home Ministry’s notification on the NCTC violated the basic federal structure of the Constitution and undermined their constitutional authority on the maintenance of law and order. Tamil Nadu Chief Minister Jayalalithaa alone drew pointed attention to the fact that an intelligence organization being vested with such sweeping powers was undesirable in any democratic polity. India’s foremost expert on global terrorism B. Raman has pointedly noted that the concept of having a single agency for intelligence, investigation, arrest and prosecution was the brainchild of Soviet dictator Josef Stalin. His brainchild, the KGB, was responsible for the arrest, detention, disappearance and execution of thousands of innocent Russians during his rule. Moreover, as a matter of principle, it is unwise to concentrate wide-ranging powers in the hands of a single intelligence agency, whose actions are not subject to rigorous parliamentary scrutiny. This is not to suggest that the IB in India has any propensity for indulging in extra-constitutional acts. The IB is an organisation which is respected by its peers internationally for its professional competence. Given the way it functions, much of what it achieves does not receive public attention or acclaim. Nevertheless, institutional checks and balances remain crucial for democratic governance. Following the terrorist strikes of 9/11, the Americans introduced a number of changes to make inter-agency cooperation and coordination more effective. One of the measures undertaken was the establishment of a National Counter-Terrorism Centre to ensure better coordination between intelligence and investigative agencies. But the American NCTC has no powers to investigate crimes, or arrest and prosecute terrorists. This power remains with the FBI, which like the CBI is an investigative agency, though it enjoys far wider powers and has a larger role than the CBI. Similarly, the UK Counter-Terrorism Command was created in 2006 by merging the anti-terrorism branch and the special branch of the Metropolitan Police. This command has the powers for investigation, search and arrest. The MI 5, which is the British equivalent of the IB, does not have powers of arrest or prosecution. New Delhi should bear this in mind while refashioning the role of the NCTC. This year has also not started well in the conduct of foreign policy. Uncertainty and faulty assessments of developments in the Maldives led us to initially label what in reality was a coup as a constitutional transfer of power. Not surprisingly, busybodies like the British jumped into the fray offering advice to the Maldivians on what they should do. India has to ensure that there is no Islamist takeover of the Maldives. Surely, all this should have been anticipated and an Indian Navy destroyer positioned alongside Male to give substance to the messages being conveyed by our diplomats. But all this pales in comparison with the looming crisis in our relations with Bangladesh. Two major agreements, on the demarcation of the land boundary and the sharing of the waters of the Teesta river remain unimplemented because of opposition within India. It is obvious that whatever consultations the government may have held with West Bengal Chief Minister Mamata Banerjee were not considered adequate unlike those held by Defence Minister Jagjivan Ram on the Farakka issue with then Chief Minister Siddhartha Shankar Ray in April 1977, or the subsequent negotiations for the final Farakka Accord in 1997, in which Mr Jyoti Basu was actively involved. It will be a major foreign policy disaster if New Delhi does not get West Bengal Chief Minister and the National Opposition leadership on board in tackling both the river waters and boundary demarcation issues. We will be letting down a friendly Bangladesh Prime Minister who had placed her faith in us. It would pave the way for a return of rampant anti-Indian rhetoric and Islamist tendencies in the polity of Bangladesh. Foreign leaders will be loath to believe the assurances we give, or promises we make. Adding to this dismal external picture is the concern voiced by our astute Finance Minister Pranab Mukherjee stating: “As Finance Minister, when I think of the enormity of subsidies to be provided, I lose sleep.” He was echoing the statement of Agriculture Minister Sharad Pawar that the proposed Food Security Bill was not implementable. Populism and fiscal profligacy have led to disaster in European countries like Greece, Italy and Spain. Must we follow the same route? Two more friends joined in. As the campus is wi-fi, they took out their swanky mobile sets, searched for their Facebook accounts and began chatting. I wondered if that would be the future and found the answer myself that technology should bridge the gulf between friends. Forlorn, I also started Net surfing on my mobile. Welcome to the new world of friends! Image four chum friends, that too girls, together and no exchange of words except the miracles social networking sites can do! I for once recalled the recent reunion my father had with his college-mates the other day at a plush city hotel. My father was asked to crack a joke and he said that three women were sitting in a room and still there was complete silence. It evoked instant laughter. Francis Bacon, the famous essayist, said that “a friend is another self” because a friend can relate to another friend as he relates to himself. The same essayist went on to say that a “great city is a great solitude” explaining that friends are scattered here and there. However, the friends could still communicate faster through a sort of telepathy as friends could perhaps imagine and decode feelings and thoughts before these were actually verbalised. However, in today’s virtual world, friends may be sitting close by and yet miles apart thanks to the digital divide. Initially, the digital divide meant those having access to computer technology and those sans computers, but now it is a different kind of divide between those blessed with new-age gadgets. A recent study spanning 52 nations and covering 25,000 people, “Interheart”, bids a warning that people having latest gadgets were at 27 per cent higher risk of having a stroke than those who did not. However, there does not seem to be a return to the native as Thomas Hardy had suggested. We find that even while preparing for examinations these days, there are fewer discussions with friends and teachers as students prefer to tap fast technologies. My own brothers use browsers which they call virtual assistants as they can save notes, read those on the desk-top and clear doubts. The remaining time is spent on play stations. A mock advertisement that a well-known doctor, Pankaj Garg, posted on the Facebook for a few vacancies of Expert De-Addictologists actually point to this new addiction! It said that one can be considered for the post if one had a minimum of 10-hour-years of Facebook addiction (two hours every day for three years make six-hour-years). It went on to say that if you have lost a job because of Facebook you are eligible for faculty position; if you have separated from your spouse or a dear friend because of FB, you are eligible for a professor’s position; and if you have a written certificate from Mark Zuckerberg to leave FB because of overuse and causing FB server fatigue, you can be considered for the post of Head of Department! In this context I feel that it may be useful to make a few introductory observations. In the past decades there have been serious internal disturbances and communal conflagrations in several parts of the country. The affected States have not been able to timely and effectively deal with such developments on their own. Consequently, the Union has been deploying Central Police Forces, and even the Army, to restore normalcy in the disturbed areas. In certain cases, as for instance in the North-East States, such deployments have been on an extensive scale and for prolonged periods. This has led, among many other consequences, to prolonged agitations for the repeal of the Disturbed Areas Act and the Armed Forces Special Powers Act on the ground that the enforcement of these laws has resulted in large-scale violations of Human Rights of the affected populations. The Government of India has had the aforesaid laws examined by several Committees in the past years. It has, however, not so far been possible to arrive at any clear cut decision regarding the amendment or repeal of these laws. In the past three decades, the States have been questioning the Union’s constitutional authority to take pre-emptive action to deal with an emerging internal disturbance in any part of the country. Without detailing the arguments raised by the States I would briefly state that, as of today, the Union does not have the authority to suo motu deploy Central Police forces in any State or part thereof to prevent or pre-empt an arising serious disturbance. As per the practice which has evolved over the years, the Armed Forces of the Union have been deployed only after consultation with the affected State Governments or at the latter’s specific requests. Do States have a case? Considering the enormous cost paid by the country for the State Government’s failure to prevent the demolition of Babri Masjid, questions have continued to be asked as to what exactly is the Union’s responsibility in such matters. And more recently, after the gruesome terrorist attack in Mumbai in November 2008, serious questions have arisen even about the inherent capacity of the Union to deal with such situations. Time has come to arrive at clear agreements, within our federal arrangements, to lay down the respective responsibilities of the Union and the States for effective security management. If such agreements cannot be secured then, in my opinion, we need to urgently bring about the required constitutional amendments to ensure that, between the Union and the States, the country can be effectively protected from terrorist and other attacks which may arise from within or beyond our frontiers. In the context of these introductory observations I would state that, since the advent of terrorism in our country, the safeguarding of national security has emerged as perhaps the most crucial area of governance. It has been realised that endeavours to promote the welfare of our people would have little meaning if the very unity and integrity of the country is threatened and the security of all our people cannot be fully assured. 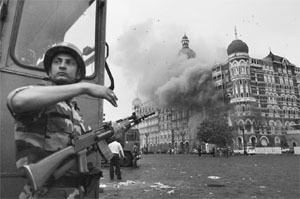 The Mumbai terrorist attack has warned us that no more time can be lost in reorganising, enlarging and strengthening the national security management apparatus for effectively preventing and, as necessary, successfully encountering every threat to the Indian State, from anywhere across its land or sea borders or from across the air space. National security could be defined, in simple terms, to comprise external security, which relates to safeguarding the country’s territorial integrity against war or external aggression, and internal security, which concerns the maintenance of peace and public order within the entire country. Security experts and analysts have generally found it convenient to separately address issues relating to the management of internal and external security. In my view, such a sectoral approach is no longer tenable. Ever since Pakistan launched a proxy war in Jammu and Kashmir and Jihadi terrorist networks started operating in India, the traditional distinction between internal and external security got obliterated and, as we have seen, issues relating to these two arenas have got growingly intertwined. It is no longer practical to deal with them separately. It also needs to be recognised that, over the past years, the arising security threats and their sources have geographically spread far and wide, far beyond our immediate and extended neighbourhoods, to countries in the Middle East, South East Asia and even in the Western hemisphere. Consequently, our internal security concerns have also spread to cover myriad issues and, today, it would just not do to merely focus on the threats to physical security. Internal security management is now required to be viewed holistically and, for this reason, it has become essential to provide security in respect of almost all areas and particularly in respect of food, water, energy, nuclear power, economy, environment and ecology, science and technology, cyber security and so on. For effective internal security management it would also require to be kept in view that our country represents an immense cultural and geographical diversity and the well over one billion of our people comprise multi-religious, multi-lingual and multi-cultural societies in which certain socio-religious practices, traditions and customs are rooted in thousands of years of recorded history. Further, it needs to be remembered that the free interplay of cultural and religious identities in our vast and unfettered democracy generate disagreements and confrontations, which have the potential of leading to conflicts and large scale disturbances, particularly when anti-national elements join the fray, with or without involvements from across our frontiers. If the unity and integrity of our country is to be preserved it would be necessary to ensure security on all fronts and, besides, promote tolerance and communal harmony among our people. For appreciating the scale and complexity of our national security concerns it would be useful to keep in mind that India is a large country with land borders of over 15,000 kms, a coast line of over 7,500 kms, over 600 Island territories and an Exclusive Economic Zone of over 25 lakh sq kms. We also cannot afford to forget, even momentarily, that the internal situations obtaining in most of the countries in our immediate neighbourhood are generating serious threats to our national security. While it may not be meaningful to recount the varied security threats which we have faced since Independence it could be said that, briefly, the more worrying internal security threats which our country is encountering today relate to the continuing proxy war in Jammu and Kashmir; Jehadi terrorism which has continued to grow both in its reach and spread; Left-Wing Extremism and the still active insurgencies in the North-East States. After its successful foray in Punjab about three decades ago, in end 1989 Pakistan launched a proxy war in Jammu and Kashmir which is still continuing. In the past decades, Pakistan’s Inter -Services Intelligence (ISI) agency has continued to expand its terrorist activities across the length and breadth of the country. Besides, Pakistan terrorist cells have also been operating from bases in the Middle East and from the soil of at least two of our neighbours. The activities of Pakistan based Jihadi groups have resulted in the security environment in the vast hinterland of our country continuing to remain threatened for the past many years now. A relatively more recent phenomenon, which is no less worrying than the importation of terrorism, is the birth of a number of radical counter groups which have been aggressively organising to retaliate against terrorist violence unleashed by the Jihadi networks. The emergence of such radical groups carries the grave danger of promoting hate politics and divisive ideologies which could lead to large scale communal violence and pose a most serious threat to our secular fabric, and even to our democratic framework. The alarming activities of the Indian Mujahideen, which were first heard of in late 2007, have also been spreading. Investigation agencies have revealed that this group has been operating in India with the active support of an underworld network in Karachi, which works in collaboration with Pakistan-based Jihadi groups. The cadres of this outfit have the resources and capability of perpetrating serious violent incidents in various parts of the country. Besides providing ideological support, training, weapons, communication systems, funding and other required logistical support to the terror groups, the ISI, notwithstanding the foreign policy statements made by the Pakistan Government from time to time, has been continuing with its activities to enable cross-border infiltrations for intensifying violent activities in Jammu and Kashmir. Pakistan is continuing its proxy war in J&K. According to certain recent reports, the ISI has also stepped up its activities to revive Sikh militancy in Punjab by providing financial and logistical support to establish terror modules from among militants in the Sikh diaspora. It is also reported that the ISI has been pressurising various Sikh militant groups to arrive at operational understandings with each other and, besides, to join up with the Kashmir-centric militant outfits. The armed struggle being carried out by the Left Wing extremist groups, aimed at capturing political power, has emerged as perhaps the foremost internal security challenge to the country. Of the various elements which subscribe to violence, the CPI (Maoist) is the largest group which has been responsible for the rather significant increase in incidents of violence since 2007. The year 2010 witnessed a sharp increase in violence caused by the Maoists in Chhattisgarh and West Bengal and a visible enhancement in the activities of this group in Bihar, Andhra Pradesh and Maharashtra. The incident at Dantewada, which resulted in the killing of 76 CRPF personnel, was the largest-ever Maoist strike against the security forces. There are reports that the ISI is striving to establish a linkage with the CPI (Maoist) group and the latter are trying to establish a nexus with the insurgent groups in the North-East region. In so far as the activities of the various insurgent groups active in the North-East region are concerned, recent reports suggest that the number of incidents and the levels of violence have somewhat declined in the recent past, consequent to the Centre’s initiatives to engage the warring groups in peace talks, some of which have been progressing well. Serious public disorders have also been caused by varied other developments and the past year witnessed highly disruptive agitations in several parts of the country. Among these were the pro-Telengana agitation in Andhra Pradesh, the United Naga Council economic blockade in Manipur and the pro-Gujjar agitation in Rajasthan. All these agitations adversely affected the maintenance of peace and public order. The author is currently the Governor of Jammu and Kashmir. He is also a former Defence Secretary, Home Secretary, Principal Secretary to the Prime Minister and chaired the National Task Force on internal security in 2000. The article is adapted from his talk on ‘National Security Concerns’, delivered as the 28th C.D. Deshmukh Memorial Lecture at the India International Centre, New Delhi, in 2011.